Ice Wharf offers a range of beers, wines and spirits together with a choice of pub food. 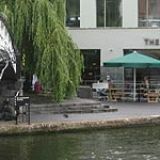 The beer garden is situated next to Camden Lock and is an ideal choice for alfresco dining in fine weather. Do you work at Ice Wharf? What did you think of Ice Wharf? You've hit the nail on the head. The location is great on a sunny day as it has benches outside near the canal and a picturesque weeping willow (i love those trees). The problem with Ice Wharf is the service. I waited with my friends at the bar for near 15 minutes and the bar wasn't even packed. The bar tender had forgot the most important rule of bar tender, being personable. He completely ignored our attempts at getting his attention. He was simply rude. I exclaimed loudly that we should move elsewhere and then he marched over to serve us, but by that time the damage had been done. However, I must say that it was only one bar tender, I went there a couple of months ago and this very sweet (and cute) bar tender had given us too many cocktails and the manager gave them to us free of charge without reprimanding him. So it's swings and roundabouts really. This place is in such a nice loaction, really too bad for the staff's behaviour to ruin its reputation. My friend saw an ad in the ladies clearly stating that that week's offer was St George's week and they had gin & tonics on offer. After ordering we were quoted a full price, so we asked the bartender about the poster. They discussed it with the "manager" or whoever he was and the guy told us quiete rudely that either we pay the full price or we can leave. He said he didnt put the poster there, so there is nothing he can do. (?) We debated why the hell would you put the poster out to advertise something then?! He was rude again and we decided to say no thanks, we are not gonna pay the full price. So he threw the drink out in the sink in front of our faces - he might as well just punch us in the face next time. We do work in hospitality and I have never seen such a bad attitude from a "manager"/ employee. I would fire him straight away if it was up to me. Customer service 0! Since then we tell all our clients to avoid this place. Good job, keep it up.. ! 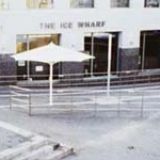 I have been to Ice Wharf a few times over the past few years, against my better judgment. The bouncers are on a real power trip, very rude and dismissive. My biggest shock was to see a man stood outside, refused entry due to no id, which I can normally understand, except he had grey hair and looked about 45- whatever happened to common sense!? I don't know how they can pass off their cocktails, I have never tasted such a horrible Mojito! The location is great but again I find this another one of those Camden bars that have lost all concept of Customer Service. A real let down as Ice Wharf could be fantastic! Beautiful location. This is it. Really bad service didn't get some of the staff i did order. Unprepared staff. Not vegan options just salads. Cheap compare to other places.and for sure I know why. Never again. absolutely disgusting, unhelpful and violent bouncers at the door, dont expect help from management either as they seemingly dont care if women are assaulted by their own staff. always problems on the door if they dont like your face. dont waste your time, never going again! also pretty annoyed at the fact i had to give it a 1 star rating in order to post this as it is not worthy. This bar should be renamed the nanny state. Firstly you need to show photo id to get in. Then you get searched. This is a pub for gods sake.Its easier to get into north Korea. Once you get in you can expect to be monitored by one of a dozen hi-viz wearing security staff that mingle wit your fellow drinkers. Should you order bottles they will be decanted into glasses so you don't know what is what. Easily the worst pub ever. Camden has loads of other bars...I suggest you go there instead. This place is ruined by it's absolute thugs of bouncers. They're posturing, aggressive and extremely egotistical, marching round and literally barging people out of the way, giving people dirty looks and making rude and uncalled for remarks to punters... generally acting as if they are some kind of gods. Too many steroids perhaps. Avoid this place if you want a pleasant, thug free evening. Horrible and aggressive door staff who seem to have the attitude that the bar are doing you a favour by letting you in to buy overpriced drinks. I would never go back to this place as there are far better places in the area. It's a shame as the bar is in a good location. This is a Wetherspoons/Lloyds in an ideal location. The food and drink are nice and cheap as you would expect from 'spoons, and added to this, Lloyds has an amazing outside area that stretches right to the canal. On a hot day, drink in hand, taking in the sights of Camden; you couldnt ask for much better. Your typical Wetherspoons pub is given a lift thanks to the excellent outdoor area. Ice Wharf is a surprisingly nice addition to the Camden scene. 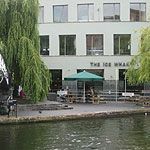 Built overlooking Camden Lock, Ice Wharf has a great outdoor area to pass the summer days and nights with friends and a bottle of wine. Located just off Camden High Street, this bar can be hard to find if you don’t know the area. When you do find it, don’t let the sometimes alien people of Camden scare you off, they’re actually a great crowd. This bar is massive, for a pub that’s open at 9am it’s the same size as many nightclubs. Plenty of seating is available throughout the pub and outside; although it gets really packed on Friday and Saturday nights. 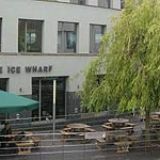 As with anywhere in Camden, you’ll find a unique group of people at Ice Wharf. Don’t let this put you off as the wild diversity creates an atmosphere of tolerance. 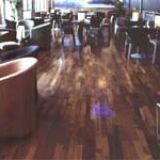 Ice Wharf is no different; you can relax in the comfort of the wild surroundings. The bar staff are just as ‘Camden’ with pierced noses and pink hair. The atmosphere changes in the evening when the DJs or live bands play. One thing that is big disappointment is a significant lack of glass collectors, don’t be surprised if you have to clear your own table. As with all Wetherspoons, the food at Ice Wharf is cheap and cheerful. Expect to find the usual burgers, steaks, and sausage and mash dishes. The variety is huge and the prices low. There is also the usual choice of deals on food and drink. If you’re planning to take your family for lunch you can easily feed four people for less than £25. The food is not amazing, but the portions are adequate and the prices low. Wetherspoons focus their promotions on cheap food and drink. With a promotional voucher you can get a pint of Guinness for £1.49 or a pint of Carling for £1.39. The deals are vast but don’t expect any more than the bare minimum. Especially don’t order the cocktails; mojitos are made with lime cordial and everything else seems to be vodka and coke or Bacardi and orange with a exciting name, disguised as a delicious cocktail. However, there’s a wide selection of real ales, and at rock bottom prices no one can complain. The best way to find the latest deals is to go down on the day and view the menu or posters on the walls. Ice Wharf is, ironically, best enjoyed when basking outside in the summer sun with friends and a bottle of wine.